Why is My iMessage Not Working on iPhone? If you are unable to send messages on your iPhone, iPad or Macbook then there must be a problem with your iMessages app. There can be many reasons why your iMessage app is not working properly. A blue bubble indicates iMessages while normal text messages are indicated by a greet bubble depending upon your contract. We will go through number of troubleshooting tips to fix your iMessage not working problem. By the end of the article you will be able to send messages on your iPhone, iPad and MacOS. iMessage is different than normal text messages. iMessage is sent between Apple’s devices and it can’t be sent to other devices such as Android. It uses data to to send messages between iOS devices. iMessage can stop working because of many reasons such as server not working, software problem or may be problem with your settings. You also need to know whether iMessage is not working with one of your contacts or all the contacts. You can try sending the message to multiple people in your contacts. If all the messages don’t go through then problem is with your message app. If the iMessage doesn’t go to any one of your contacts then probably the problem is at their end. A Blue bubble means message went through iMessage and a green means it used your cellular data. Below methods will help you to fix your iMessage problem with iOS 8, 9, 10 and other newer updates. The first thing you need to do is to check whether iMessage server is working or not. Many times in the past there had been outages in Apple servers which handles iMessage services. You can go to Apple’s System Page to check if server is working perfectly or not. You will get a detailed report regarding many Apple’s servers and their performance in the last 24 hours. You will also get details regarding maintenance work and other issues which have been resolved recently. If all is well then problem may be at your end. As an alternative you can try searching “iMessage” on Twitter and Facebook to see if there is a lot of conversations going on at that time. If lots of people are facing the problem then problem may be at Apple’s end. You could wait for few more minutes to check if everything is working perfectly or not. You can still send messages to your favorite contacts via normal text messages which used cellular data. You can also try below troubleshooting tips to fix iMessage not working problem. Internet connection is must for iMessage. iMessage uses data for sending messages to your loved ones. If you don’t have internet connection or your net connection is poor then iMessage will not work. If your iMessage isn’t working then make sure to check your internet connection. You also need to make sure that your data plan has enough data left in your account. If you have a low signal problem then try turning off Airplane mode and turning it back ON. Sometimes it improves the signal strength which results in a good internet connection. If you are connected through Wi-Fi signal then you should check the connection again. Try disconnecting and connecting to the internet again. If it still doesn’t work then you should try sending the message as “Send as Text Message“. However this last tip will work only in the iPhone. GPRS connection is enough to send the message in this case. You need to setup your iMessage correctly in your iPhone. There is a chance that something may have changed which changed the settings of your iPhone. You should make sure that iMessage is turned ON in the settings. Go to Settings >> Messages Click on the menu item called “Send and Receive“. Now you will be able to see phone numbers and email addresses which are configured for iMessage. Check the section ” Start new conversations from” and if there is no checkmark in front of your mobile number then click on it to activate iMessage for your number. You can troubleshoot just by checking whether iMessage doesn’t work with your number or just email addresses. Trying the process of elimination will enhance the chances of your iMessage going through without any difficulty. Sometimes iMessage doesn’t work out due to sign in problems. You simply need to sign out and sign in back using the Apple ID in your iPhone or iPad. Go to Settings >> Messages. Click on “Send and Receive”. Tap where “Apple ID” is written and click on Sign out. Now sign in back using the same Apple ID and try sending a message to one of your friends. If the iMessage wasn’t working due to login problems then it will be resolved after this. 5. Check for iOS Updates regularly. iOS in your Apple devices must be updated regularly. In order for every application to work perfectly you should update your iOS regularly. Most of the time your device will tell you that an update is available for your device. You should connect to your nearest Wi-Fi and update the iOS. Apple keeps pushing updates for various applications such as iMessage, Camera etc. Updating it will fix the iMessage not working problem. To update your iOS in iPhone. Go to Settings >> General >> Software Update. You can update the iPhone Software from here. If there is no update available for Apple device then up to date message will be shown on the screen. Sometimes your network settings can create a problem with your iPhone applications. Fixing the network issues will help you resolve all the errors in applications. You can reset the network settings in your iPhone, iPad and Macbook very easily. 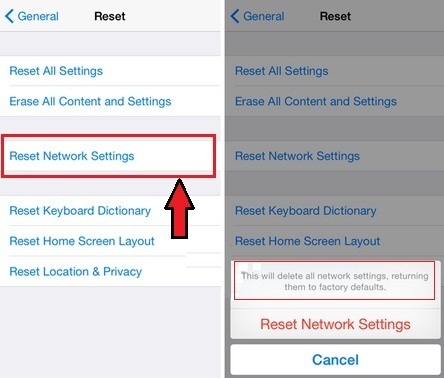 You can reset your iPhone or iPad’s network settings by going to Settings >> General >> Reset and Click on “Reset Network Settings”. Make sure you have your Wi-Fi passwords because resetting the network will erase all the data related to network within your iPhone. Have you ever heard about the find my iphone app? It can find your phone when lost. This entry was posted in Best iPhone Tips and tagged Fix iMessage Not activating, Fix iMessage Not Working for iOS 10, Fix iMessage Not Working for One Contact, Fix iMessage Not Working for One Person, Fix iMessage Not Working on iOS, Fix iMessage Not Working on iPad, Fix iMessage Not Working on Macbook, How to Fix iMessage Waiting for Activaiton, iMessage Not Working for iPhone on July 19, 2017 by satyenhacks.